A couple of weeks back we saw Apple’s Virtual Personal assistant, Siri make a blunder when the app went on to name its competitor, the Nokia Lumia 900 as the ‘Best Cell Phone Ever’. But then, Apple was quick enough to re-program Siri and changed her mind. Now the latest newbie on the block as a personal assistant is the S-Voice which has also gone ahead and done a blunder even before arriving officially into the market. One lucky user who was able to get his hands over the S-Voice went on to test the assistant’s knowledge and found out that the app knew less about its maker Samsung and knew a bit more about its competitor Apple. 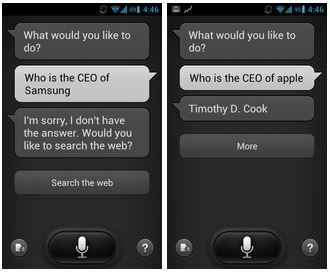 The user asked S-Voice as to who the Chief Executive Officer of Samsung is and the app went blank and accepted that it didn’t know the answer. Not that’s indeed a bummer for Samsung. But then the assistant also asked the user that as it didn’t know the answer, does he want to search the Web. On the other hand when the user asked S-Voice who the Chief Executive Officer of Apple was, the app instantly replied that it was ‘Timothy D. Cook’. So we do know that S-Voice depend on Vlingo’s servers for the answers and so there is nothing that Samsung could do about it except that it could instruct Vlingo to modify dangerous questions like this for future because once the Galaxy S III goes official in a week, users are bound to bombard the app with such typical questions.